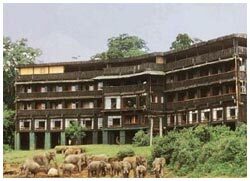 Outspan Hotel is a history of upcountry colonial elegance and was built in 1927 facing Mt. Kenya. Outspan is named to suggest how early travellers prepared to rest at journey's end, "out spanning" weary oxen from oxcarts. The hotel stands solid, comfortable and elegant in well-tented rolling lawns accented with palms. Lush tropical gardens are laid out in English style to frame distant views of Mt. Kenya. The hotel building itself has a certain graciousness of the past. Breakfast and lunch buffets are served on the open veranda with Chippendale chairs and white linen. The dinning room has an elegance of mellow wood in the moldings, parquet floors and cathedral roof beams. Candlelight makes each table an intimate little island. 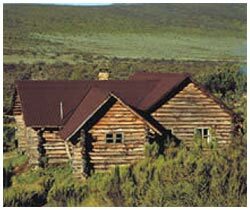 Rutundu are log cabins situated on the northern slopes of Mt. Kenya at 10,200ft just above the forest line. In total privacy, these cabins overlook Lake Rutundu and are surrounded by Alpine vegetation. It is also an ideal spot for fishermen and hikers. Both Lake Rutundu and Lake Alice are stocked with rainbow trout and is only a two-hour walk to the mountains from the logs. 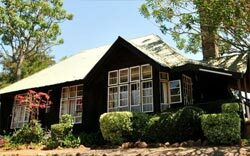 The Aberdare Country Club nestles on the slopes of Mweiga Hill. All rooms and cottages have spectacular views of the plains below, the Aberdare Mountains to the west and Mount Kenya to the East. The club's 1,300-acre wildlife sanctuary abounds with Thompson Gazelle, zebra, giraffe and more elusive leopard. You can walk or ride, play a round of golf, watched by a family of warthog, fish for trout or just relax by the pool or in the beautiful garden. The cottages are closed only the Club Restaurant itself is operating. 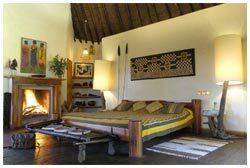 Mutamaiyu comfortably accommodates up to eight people in four African style cottages, traditionally thatched using "makuti" (palm leaves) over a vaulted wooden frame. The cottages are built of local stone and furnished with king size or twin beds. The territory surrounding the lodge offers many opportunities for daytime or overnight safaris, cultural excursions to the local villages, camel rides and trips into the forest to observe the rhinos recently brought to the reserve. 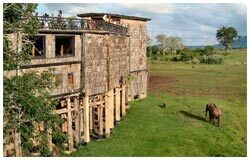 This rustic "mountain" style Naro Moro River Lodge is set among trees along the banks of a rushing stream. 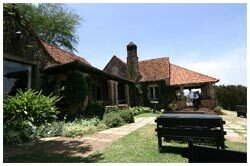 The lodge serves as the popular base for climbing Mount Kenya and offers a wide variety of accommodations. Rooms meander among terraced rock gardens that follow natural contours above the river. There is a sense of sportiness and outdoor activity at Naro Moru. Many visitors come to climb the mountain; others come for bird watching or trout fishing. A peaceful forest path winds along the riverbank. Located at 7200 FT (2195M) on the slopes of the snow-capped Mount Kenya, Serena Mountain Lodge is the most luxurious tree lodge in Kenya with private ensuite bathroom facilities. At dusk the dense tropical rain forest comes alive with myriad sounds of creatures of various descriptions. The elephant, Rhino, several species of antelopes including the bongo and occasionally, both leopard and the lion are frequent visitors at the illuminated water hole which is connected to the lodge by a short tunnel to a specially constructed bunker affording a close up view of the game. For the ornithologists, over 200 species of birds have been identified while the indigenous tropical rain forest vegetation is of special interest to the botanists. The most rewarding experience is a clear early morning or afternoon view of the rocky peaks on Mount Kenya with its over half dozen glaciers. Sweetwater’s Tented Camp lies in the heart of a privately owned 22,000 acres Game Reserve. Other than enjoying magnificent views across the game-studded plains to the snowcapped peaks of Mount Kenya, you can also watch Chimpanzees at close range in their natural habitat as this camp is situated in the heart of a sanctuary that is the home to a number of Chimpanzees. It also overlooks a floodlit waterhole, the camp offers visitors an unforgettable opportunity to watch and photograph animals in their natural habitat. Accommodation is provided in luxuriously appointed tents, set under thatch, with en suite facilities and private verandah. Each tent overlooks the waterhole. Day and night game drives by four-wheel drive vehicles, walking safaris escorted by experienced rangers, bird walks, camel safaris and outdoor dining ensures that you will enjoy your stay. 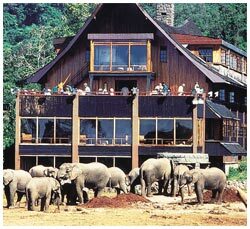 Set in the heart of the Aberdare National Park, this unique game lodge The Ark overlooks a floodlit waterhole which attracts a host of wildlife - elephants, rhino, leopard, bushbuck and occasionally an elusive bongo or giant forest hog. Resembling and named after Noah's Ark, The Ark comprises three decks from which numerous balconies and lounges provide superb vantage points for game viewing. A ground level bunker provides excellent photographic opportunities. Before embarking on the half-hour drive to The Ark, lunch is served at the charming Aberdare Country Club. Dinner and breakfast are served "On Board". 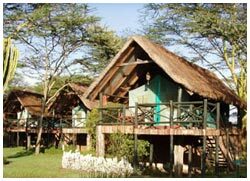 Lewa safari camp is situated in the foothills of Mount Kenya and is set in the 45,000 acre privately owned Lewa Wildlife Conservancy. The wildlife here is excellent, and Lewa has 10% of Kenya's Black Rhinos (around 47) and 20% of its White Rhinos (about 35). It is also home to 20% of the world's endangered Grevy Zebras. It is a non-malarial area due its altitude of 1700m. 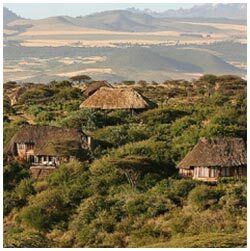 Lewa Safari Camp has 12 tents, each within a thatched structure, accommodating up to 26 guests. The tents are comfortable rather than luxurious, but well-appointed with an en-suite shower room with flush loo. They are also nicely spaced for a reasonable amount of privacy. There is a generator providing bedside and bathroom lighting morning and evening. Day and night game drives; bush walks; sundowners; visits to archeological and cultural sites; talks on the operation and history of the conservancy; village visits; horse riding. Located just inside the gates of the park, Treetops overlooks waterholes and a salt lick. The lodge rises straight and stark on stilts and is solely dedicated to game viewing. Climbing the narrow open stairs, you commit yourself to a night of close quarters and cold decks. The possibility of seeing wild animals close has created the Treetops tradition. The lounge is friendly, with big picture windows and warm wood, and there is a roof deck with open viewing in all directions. The narrow, dark paneled dinning room features long communal tables and bench seating.